(Newser) – It may be widely considered the worst video game ever made—so bad it's tied to the eventual demise of Atari—but still, not everybody owns "E.T. the Extra-Terrestrial," especially a copy straight from the famous "Atari Dump" with a property tag, certificate of authenticity, and a pamphlet with photos from 1983 and this year's dig. 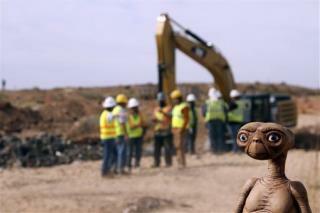 So the city of Alamogordo, NM, where documentary companies spent $50,000 on the mass excavation of a landfill earlier this year to find the games, has turned to eBay to sell some of the copies of "E.T.," as well as "Asteroids," "Defender," "Warlords," and "Missile Command," reports GameSpot. Come 2017 I will have an old never to be re-issued ex-president for sale? wonder how much i will be offered for it?